The head is large, massive, round - not apple-headed, with no indentation of the skull. The eyes are dark in color, very large, bold and prominent, globular in shape, soft and solicitous in expression, very lustrous, and, when excited, full of fire. The ears are thin, small, soft, like black velvet. There are two kinds - the "rose" and the "button." Preference is given to the latter. The wrinkles are large and deep. The muzzle is short, blunt, square, but not upfaced. Bite - A Pug's bite should be very slightly undershot. - Any color other than fawn or black. Click Here to Learn about breeder background checks on Pug breeders if you are looking for Pug puppies for sale. Click Here to learn how ResearchBreeder.com can help you find healthy Pug puppies for sale.Pug puppies for sale. Click Here to order a Breeder or Kennel Background Check on Pug Breeders that may have Pug puppies for sale. 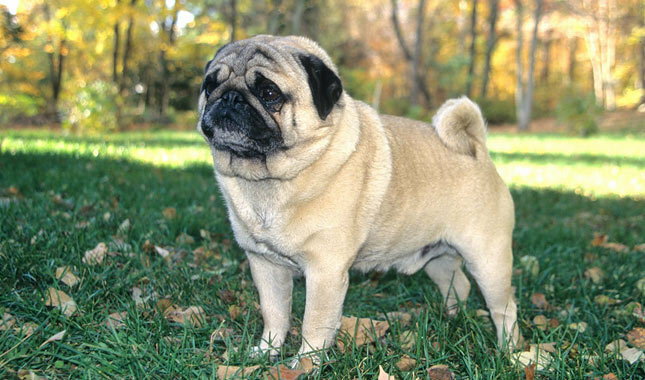 Click here to find the national breed club for Pug puppies for sale. Click Here to purchase a list of approved ResearchBreeder.com Pug Breeders who have Pug puppies for sale.